Westgate Casino Las Vegas Resort is a popular high-end resort in Las Vegas, Nevada. The hotel offers quality services ranging from hotel to hospitality. The owner is Westgate Resorts. But the operator of this facility is Navegante Group. There is the likelihood that many people get confused. Above all, this happens because the resort has different names. It opened its doors to the public in 1969. Back then, the casino goes by the name International Hotel. Later, it is Las Vegas Hilton. Today, the hotel uses a different name. At least, it uses Westgate Las Vegas Resort since 2014. With a height of 114.30 meters tall, the 30-story hotel is popular. Also, This is a big area that can accommodate some 2, 956 rooms. Out of these rooms, you will find 305 complete suites. Above all, This hotel is next to Las Vegas Convention center. Above all, This is one of the most prominent spaces in Nevada. But the hotel also boasts some 200, 000 square feet that are set aside for meetings. This area is useful when visitors want to convene for small and large gatherings. · Location: Winchester, Nevada, U.S.
· Address: 3000 Paradise Road. · Opening Date: July 2, 1969. · Number of Rooms: 2,956 rooms (including 305 suites). · Total gaming space 74,000 square feet. · Nightlife – Permanent shows: Greg London, Nunsense, Icons of Comedy Mark Curry. · Previous names: International (1969–1971). · Las Vegas Hilton (1971–2012). · LVH – Las Vegas Hotel and Casino (2012–2014). 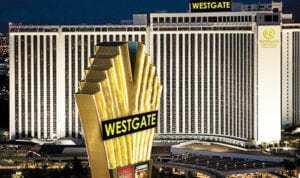 · Current Name: Westgate Las Vegas Resort & Casino. · Architect: Martin Stern Jr. & Associates. The hotel has a long and rich history. As any building that is starting, Westgate Hotel starts with the architect. Remember that back then, the hotel is under a different name. Martin Stern Jr. works on the first plan. But it is Kirk Kerkorian that builds it in 1969. Nonetheless, when it finally opens to the public, it goes by a different name. The name is International Hotel. Many things happen to the hotel in the following years. It is hard to say everything here. Many changes take place here. But the main changes such as renovation are on record. There is one tragic incident that takes place on February 10, 1981. We must point out to this incident. Although it is tragic, it is a good lesson. During this time, the hotel is fitting modern firefighting equipment. Before an arson fire starts at the Westgate Hotel, then Hilton, there was another fire. This other fire is happening in MGM Grand. The MGM Grand fire kills 85 people. This time, firefighters are cautious. They use the knowledge from the MGM Grand fire to control Hilton’s fire. Only eight people die in this incident. Natalie Cole is among those in the fire. One year later, Phillip Bruce Cline goes to prison for starting the fire. · In 1978, Leon Spinks defeated Mohammad Ali. · In 985, Donald Curry defeats Milton McCrory.